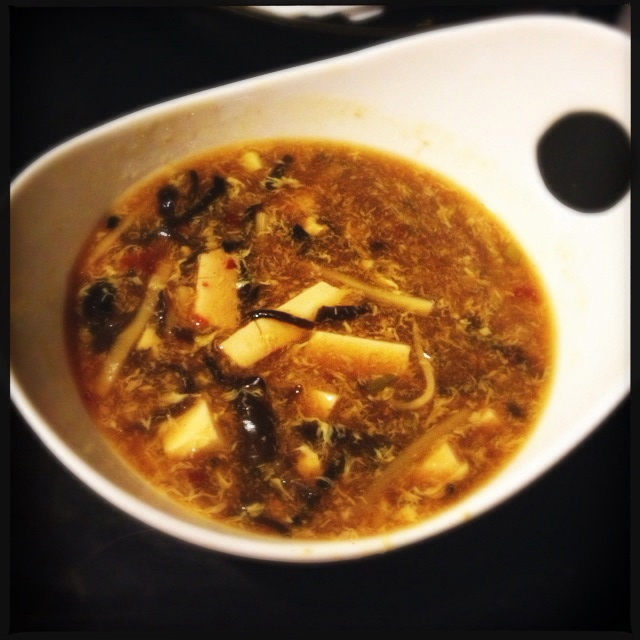 The Hot and Sour soup. In comes in styrofoam, this is the “dressed up at home” version. Photo by Vanessa Wolf. Back in fourth grade, we had a major crush on a boy named Robbie Knowles. He was an odd little dude who regularly did a spot-on monkey impression for no apparent reason. Forbidden love proved too much to shoulder at age 10. King’s BBQ and Chinese Restaurant is something of a Robbie Knowles. The masses may turn their noses up at first sight. We didn’t set out to have these feelings about King’s… but we do. 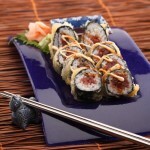 That stated, they offer some surprisingly solid, Americanized Chinese options. Make that Super Americanized: no chicken feet, jellyfish or congee up in this joint. Heck, most of these dishes were likely invented in some Chinese restaurant’s kitchen at the height of the disco era in Manhattan, but that’s just speculation. The Mochiko Chicken. Photo by Vanessa Wolf. The Hot and Sour Soup ($6.99) was pretty good. 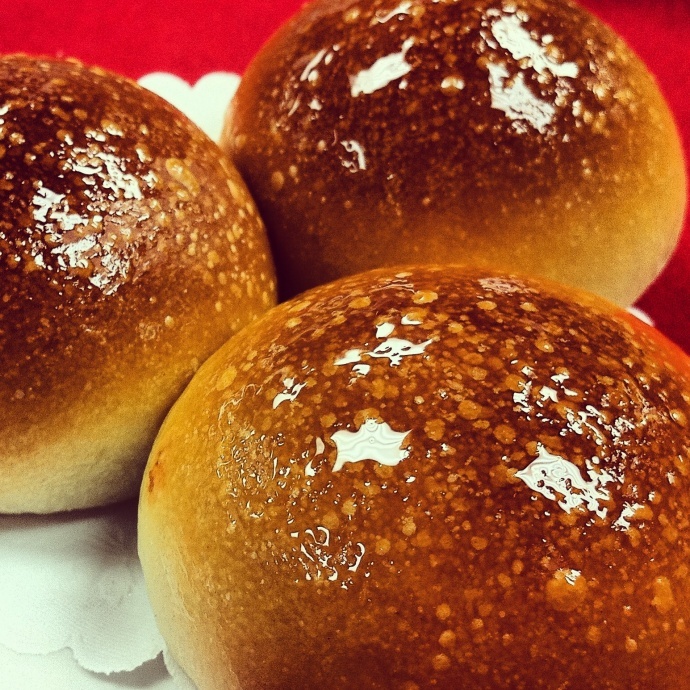 The sour notes of vinegar hit first, followed by the slow burn of some chili oil on your lips after you swallow. The broth lacks the typical corn starch-based thickness– not necessarily a bad thing – and we kind of missed the smoky notes of char sui. Still, there were plenty of mushrooms, seaweed and tofu chunks present. To bottom line it: we anticipated this soup would be a total catastrophe, ordered it anyway and were pleasantly surprised. 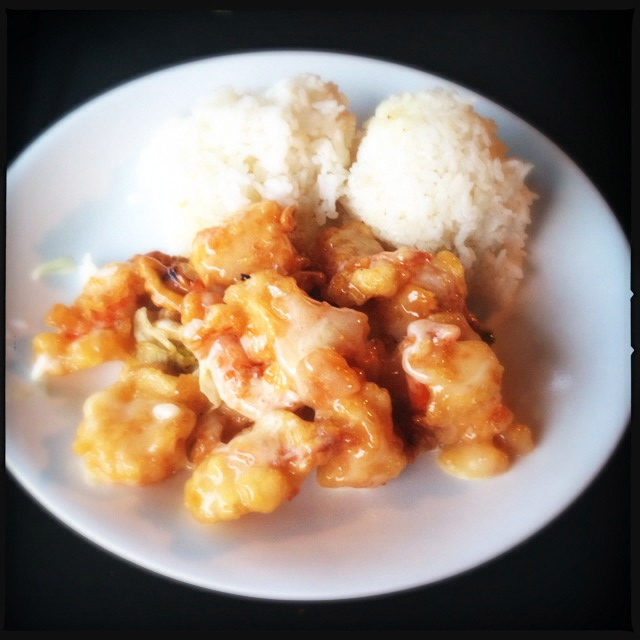 The Mochiko Chicken (mini $5.79 and regular $7.79) comes from the ‘Plate Lunch” part of the menu. The Chicken Eggplant. Photo by Vanessa Wolf. Small bits of breaded boneless dark chicken meat are fried and tossed in a flavorful sweet sauce, just as they should be. 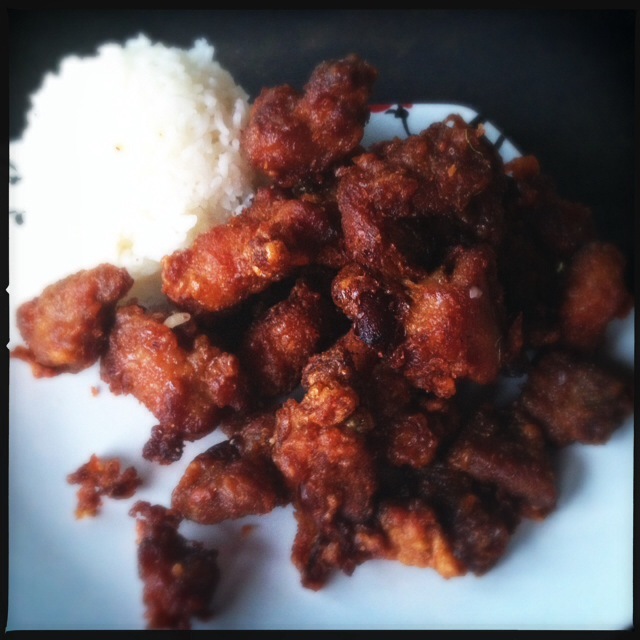 The crispy chunks retain their crispness and pair well with the mountain of accompanying rice. Don’t over-analyze: just order it. Hot mayo isn’t our bag, and this version is loaded with the stuff, as well as onion powder and a small amount of shredded carrots. Personally, unless you have some need to bulk up, we advise you take a pass and ask for all rice. 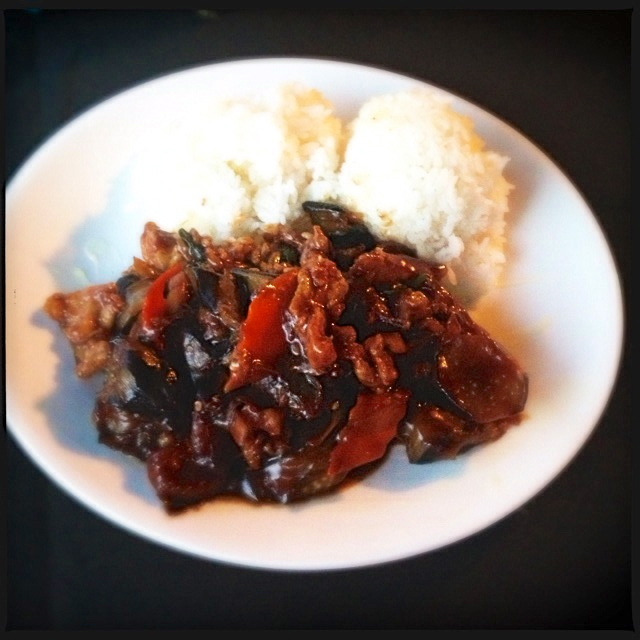 Both King’s BBQ & Chinese Restaurant locations are no frills. King’s Fried Rice. Again, we de-styrofoam containered and staged all this. Photo by Vanessa Wolf. The Kihei one is particularly shabby. There, the cash register where you pay is in the kitchen – a first for us – but it does give you a good chance to suss things out and confirm that the cooking surfaces have been properly cleaned. Employees are all very young and English is definitely a second language, but they’re super nice and quite efficient. Food comes out of the front desk/kitchen lightning fast. 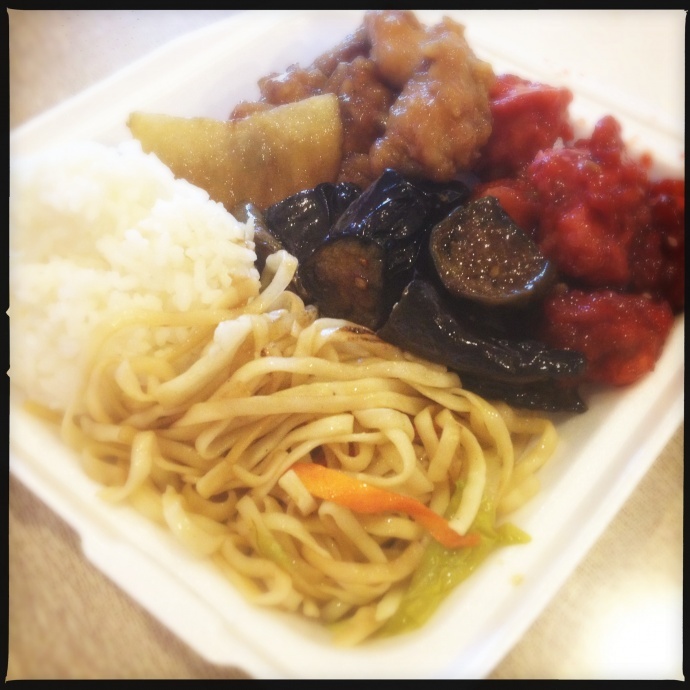 #56, the Chicken Eggplant ($7.99) is about as close as Maui comes to a mainland Chinatown. White and dark meat chicken mingle with big chunks of eggplant in a greasy, flavorful Szechuan-y sauce. The eggplant was spot on; delicate and tender. Honey Walnut Shrimp are like having candy for dinner. Photo by Vanessa Wolf. One of our super powers – and there are several – is the ability to detect MSG levels in food through Extrasensory Migraine Perception. We are happy to report that King’s didn’t set off so much as a flash of light let alone a sharp, stabby feeling in our left eye. 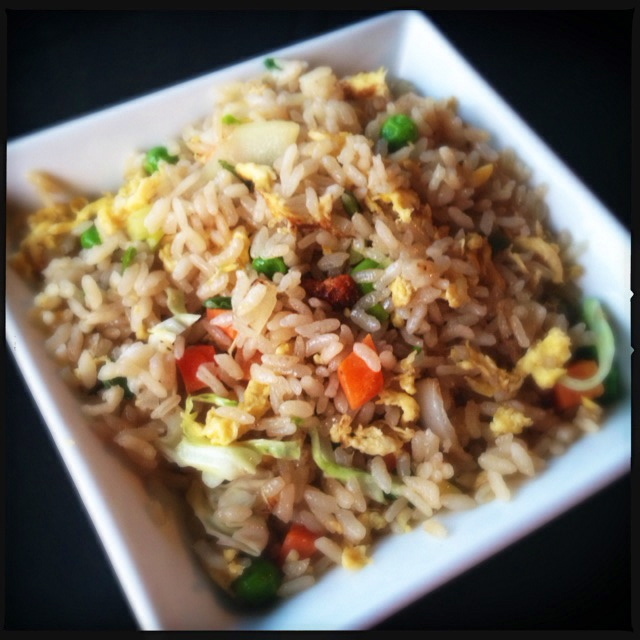 The Chicken Fried Rice ($7.99) has a mild wok flavor and is pretty standard and simple, with eggs, green and white onions and carrots. 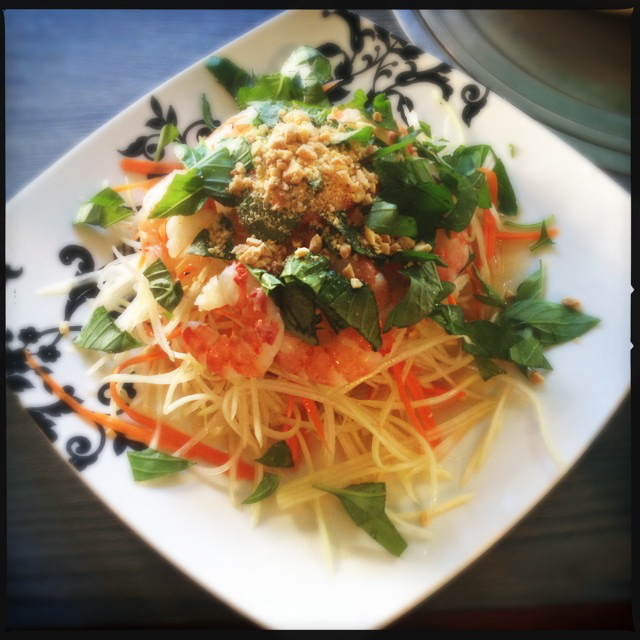 It’s on the oily side, but still a solid preparation and generous portion. The Honey Walnut Shrimp ($8) taste like America. Condensed sweetened milk, mayonnaise and honey sauce is drizzled over battered, fried shrimp and whole walnuts. We suspect a capitalist pig with a penchant for mom and baseball invented this sweet fatty “Chinese” decadence. The Chicken Chow Mein is unremarkable. Photo by Vanessa Wolf. Tradition dictates this dish emulate the Andrew Wyeth painting “Christina’s World”: just sub in a wilted bed of iceberg lettuce for a treeless tawny field. Keep the tawny though, because the lettuce was also quite brown. Hold the yuck greenery, King – or get some fresher stuff if you must – and we’ll be just fine. By now you might be making mental comparisons to Panda Express. You’re not totally off the mark in that regard, except that everything at King’s is cooked to order and boasts better pricing. 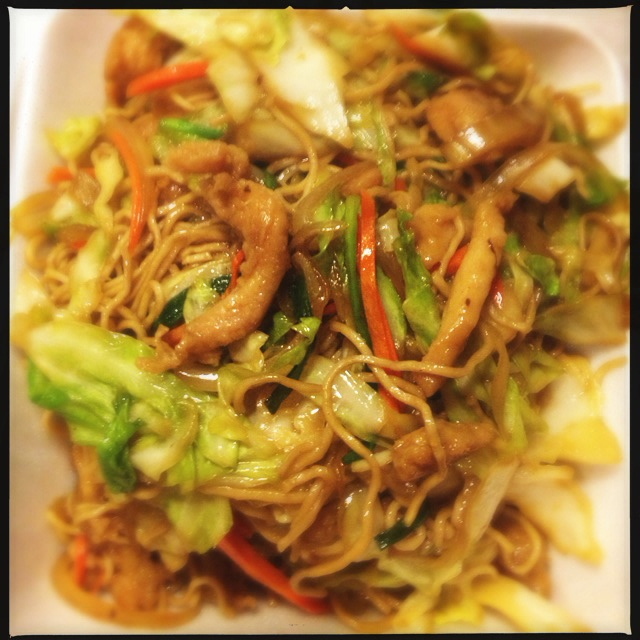 The ubiquitous Chicken Chow Mein ($7.99) was disappointing, only slightly better than the fast food version. The noodles reminded us of ramen and they’d used a heavy hand with the sesame oil. However, there was plenty of chicken along with carrots, onions and cabbage: edible in the net, but we wouldn’t order it again. 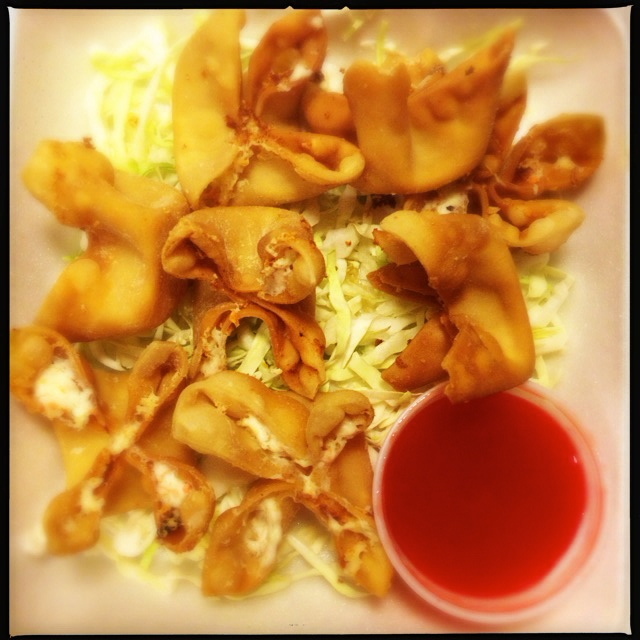 The Cheese Wontons look pretty, but the buck stops there. Photo by Vanessa Wolf. The Cheese Wontons ($4.99) were undercooked. The wonton wrapper was super chewy and the doughiness undermined every bite. Heat the fry oil up some more and this could be well worth your Abraham Lincoln. King’s also dabbles in local food. In addition to the plate lunches on the menu, there are regular specials (combos of the menu items) on the chalkboard. The BBQ Chicken and Garlic Shrimp ($10.99) offers a good sampling of highlights. The two, thin pounded skin-on boneless thighs had been nicely marinated and grilled. 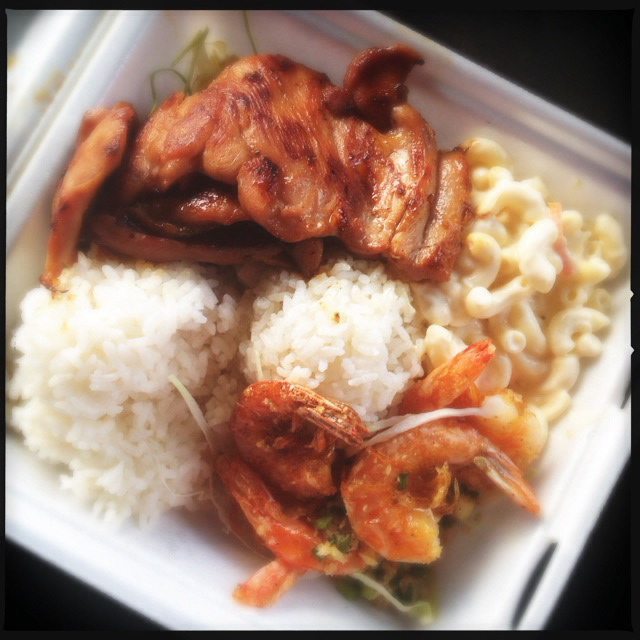 The five shrimp have a heavy raw garlic flavor and are reminiscent of the offerings of the garlic shrimp trucks that dot Kahului Beach Road. The BBQ Chicken and Garlic Shrimp. The mac salad works in this case. Photo by Vanessa Wolf. Like we said: it’s well-priced, freshly made Americanized Chinese and local food in a low-brow setting. If you’re willing to risk a fling with a new crush from the wrong side of the tracks; put on some dark sunglasses, call in some takeout, and give King’s a whirl. King’s in Kihei is open from 7 a.m. to 11 p.m. every day and is located at 1913 S Kihei Road. 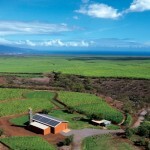 King’s in Wailuku is located at 197 N. Market.